This the map of a prison, it’s got three levels. The main floor which has a temporary cell, an armory, sleeping quarters for the guards and an office. The second floor which has the prison manager office, the storage room and a balcony. 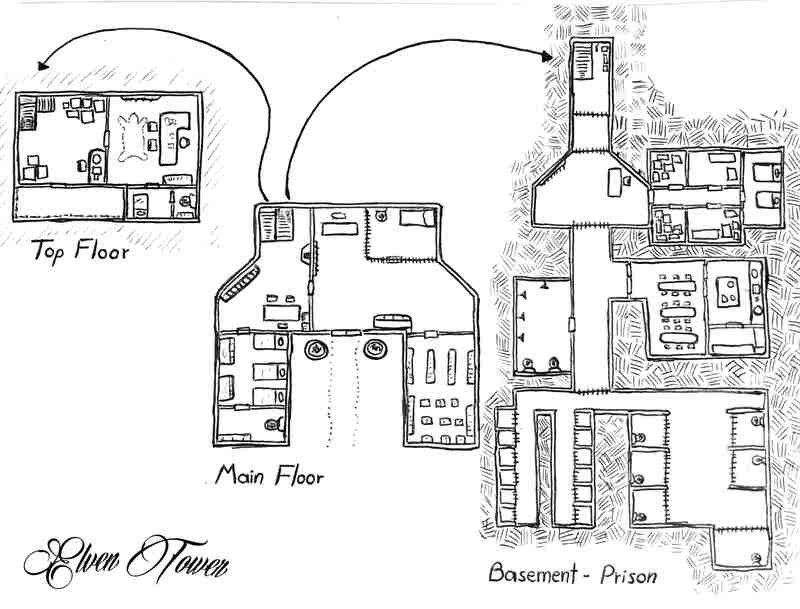 And the prison level which is underground. Areas are separated with cage doors. The first part has a check in desk and quarters for the guards. Also some storage rooms for prisoners possessions. Next, inside the prison proper, there are baths, a dinning room and kitchens. After the last caged area, there are the cells. This area is great for a prison break scenario, whether the PC’s have to break out of jail, or break in to help someone else get out of it. At any given moment there are 3d6 city guards working in the prison. The Prison manager is a seasoned veteran. Depending on the setting and party level, the DM is free to adjust these numbers or the type of guards. There could also be anti-magic cells or even a local spellcaster whose job is to control pesky magician prisoners. My mapping ventures are funded through Patreon, It is thanks to people who like my work that I am able to continue mapping and providing RPG original experiences to people all over the world. If you like what I do, consider getting involved and backing me. What you get is impressive hi-def versions of my maps to be used in your RPG games (these have lower resolution), and the satisfaction of helping the rpg community grow bigger and stronger. Help me get funding and enjoy hi resolution version of all my work. Did you like this map? There are more where this came from, visit our map index page. I want to escape from this prison! As I’ve told you on Facebook I’m definitely going to use this for my half-orc barbarians prison break scenario. Thanks so much for the awesome map! You’re welcome Jason ! Hope that 1-1 adventure is as awesome as I imagine it. Thanks for stopping by my site again. While I think it is a pretty cool map I wouldn’t use it myself as it has too many modern influences. A dedicated bathroom with a washing area for prisoners is really odd for a medieval setting. You are perfectly right ! This is one of my earliest maps and I didn’t know what you just said. Some people pointed me in the right direction and later maps don’t show those features. I also drew a boat that is historically and practically very inaccurate. Still, this map could be useful for a Victorian era or steampunk themed campaign, which would be more forgiving of these modern features. After this map and the feedback I got. I pretty much stopped adding bathrooms to my illustrations. For the reasons you expose.